If you’re looking to sell your home you must be able to effectively engage and deal with buyers’ agents in NYC. It is commonly stated that they control up to 80% of all buyer traffic, a percentage that according to the National Association of Realtors has actually increased over the past decade. 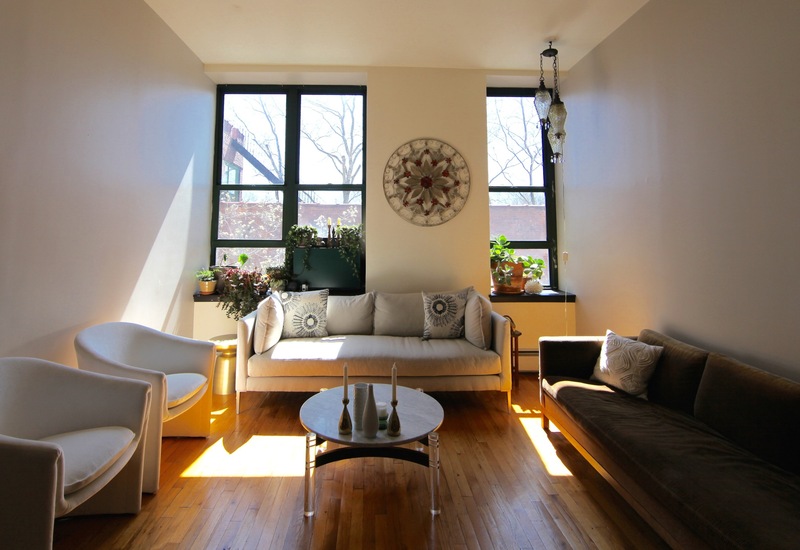 Why has the internet not eliminated buyers’ agents in NYC? The advent of popular consumer real estate search websites such as Zillow and StreetEasy has resulted in over 90% of home buyers starting their search online by themselves. However, this has not diminished the popularity of ultimately engaging a buyers’ agent for two main reasons. Buyers’ agents offer a “free” concierge service by an industry professional; it’s hard to turn down someone offering to coordinate your showings and open house tours. It’s harder still when that person also offers seasoned advice on pricing and the offer to closing process and promises to negotiate on your behalf. Major consumer real estate search websites make money by promoting the inter-mediation of buyers’ agents; just look at any listing on any major real estate search website and you will see multiple buyers’ agents who have paid to advertise in addition to the actual listing agent as contacts for any given property. What should NYC FSBO sellers avoid saying to buyers’ agents? When should you reveal your identity as the seller? Unless you are listing your home for sale via an Agent Assisted FSBO, you will have a tough time dealing with buyers’ agents in NYC. There are over 50,000 licensed real estate agents in NYC and brokers with real buyers will generally ignore traditional FSBO sellers because of the inconsistency and inability of being able to get paid. Just imagine you are an agent with a cash buyer client from China. Why on earth would you show him a FSBO listing? You would have to contact the FSBO seller first to make sure he’s willing to pay a commission. Then you’d have to get him to sign a fee agreement so that you will indeed get paid if your buyer closes the deal. During all this time you realize the FSBO seller likely hates agents and may use the first opportunity possible to contact your buyer directly and cut you out of the deal. Moreover, agents generally are afraid that FSBO sellers have no idea what they’re doing (since they aren’t professionals) and may even be mentally unstable (given how niche selling FSBO is). The best way to minimize harassment should you choose this difficult route would be to hire a security guard or have a physically intimidating friend present at your open houses. Not only will you be harassed by incessant cold calls and emails (expect hundreds of cold calls including repeat calls from agents whom you’ve already turned down) from junior agents trying to solicit your listing, you will be aggressively solicited in person by agents at every open house you hold. Moreover, they will often claim to have a buyer and request a private showing only to show up empty handed to pitch you on their listing services. We have heard stories of aggressive agents staying the entire open house only to pitch the owner about their services. We recommend telling them to immediately leave, removing them by force if you can and calling the police if they refuse to leave. 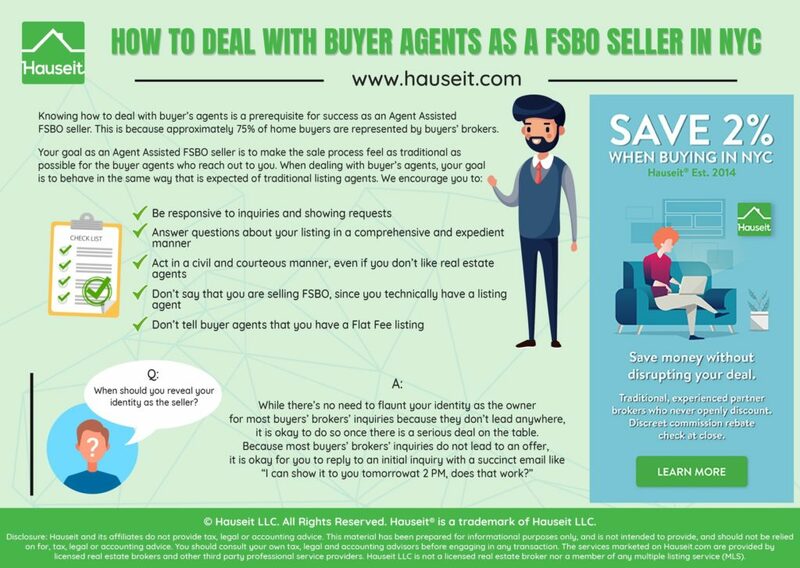 Dealing with buyers’ agents in NYC if you’ve chosen the agent managed FSBO approach is dramatically easier. Buyers and buyers’ agents should never be aware that your listing is anything different from a traditional 6% exclusive right to sell agreement. 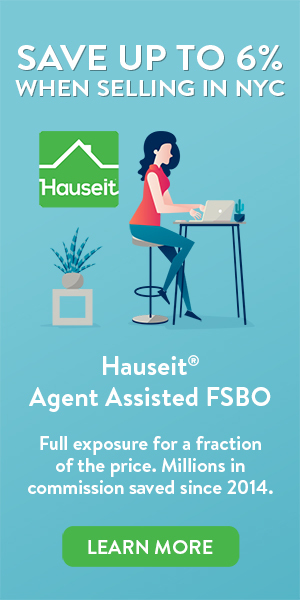 Hauseit offers complimentary managed open houses for our agent assisted FSBO customers. However, should you choose to manage the open house yourself there is no need to flaunt the fact that you are the owner. This is a great question. We agree that it’s generally best to avoid saying you are the owner and continue being ambiguous. There’s really no upside to telling this to buyer’s agents, and as you noted there may be some downside in that some of the traditional buyer’s agents don’t like dealing with owners because of a residual fear from dealing with FSBO sellers and not being able to collect their buyer agent commission which is in fact offered contractually in RLS. When asked this question, it’s best for you to continue being ambiguous. If you are pressed on the issue, the best response would be to say that the listing agent couldn’t make it today so you are happy to fill in on his behalf as the owner. You can let them know that because you know this property better than anyone and are very hands on by nature (or you are very sensitive to visitors in your apartment, etc) you’ve requested to be more involved in the sales process. As you navigate the sale process, please be sure to make it clear to potential buyers and buyer’s agents that our affiliate brokerage is your exclusive listing agent, a REBNY Member Firm and that you have requested to be involved in the sale process directly. There is no need to directly mention the exact nature of our relationship (the fact that you aren’t paying 6%), other than the fact that our affiliate broker is your listing agent! When dealing with a buyer’s agent in NYC who asks to confirm the buyer’s agent commission amount on offer, you can remind them that the buyer’s agent commission percentage offered is listed in the RLS database via our affiliate brokerage. Now that you know how to deal with buyers’ agents in NYC, you can decide whether you’d prefer to pay less and do more of the work yourself via our flat fee RLS listing service, or you can select full service for 1% if you don’t have time to manage your sale on your own. What should NYC FSBO sellers avoid saying to buyers' agents? Hi Christian – may we ask you to please refrain from telling brokers that this is not a full commission listing? It doesn’t benefit you in any way and it also hurts our reputation as a full service firm! In case you missed it, we’ve included the original listing introduction email below. What’s wrong with telling buyers’ brokers about your discounted commission arrangement? For one, some of them may become confused by what you’re telling them and proceed to have doubts on whether their commission will be honored. Doing this may cause some buyers’ agents to think that our partner brokerage doesn’t have an exclusive listing agreement with the owner and is simply posting it without permission as an open listing. There is no upside for you in telling buyers’ agents that you aren’t paying full commission on the listing side. Your listing looks like a full commission, standard listing in RLS to the wider brokerage community, so let them do their job and show your property! Why would you bring this topic on? It does not help you in any way and also actively hurts the full service reputation of our broker affiliate who has so kindly broken ranks with the industry to help you! While there’s no need to flaunt your identity as the owner for most buyers’ brokers’ inquiries because they don’t lead anywhere, it is okay to do so once there is a serious deal on the table. Because most buyers’ brokers’ inquiries do not lead to an offer, it is okay for you to reply with succinct emails like “I can show it to you tomorrow at 2 PM, does that work? -Mike.” There is no need to elaborate on your ownership of the property as most of these inquiries and showings never lead to anything. If pressed on the issue, you are always free to explain that your listing broker is very busy and you have elected to take a direct role in the sales process. Remember that as the owner, you are free to show and negotiate the sale of your own home without being licensed. It is normal for owners to occasionally show their own homes if their listing agent is busy! In our experience, you will not have any issues with buyers’ agents from any of NYC’s brokerages. Only in very rare instances have we heard complaints. See below for an example of a trollish real estate agent with zero listings who complained about not being aware that the seller was the seller a few days before closing. Our affiliate broker quickly made a fool out of this troll in front of everyone on the deal whom she had copied. Jennifer, I’m the seller’s agent. The sellers have taken a more direct role, hence the [seller] is sometimes involved. Congrats to everyone on this deal! I’ve not once spoken or communicated with you directly at all….you referred me to deal with [seller] upon my initial contact, implying that she was your firm’s agent on this property. She showed the property and handled ALL negotiations (not just “sometimes involved”). Neither the owner’s wife or you ever disclosed that she is the wife of the owner and occupant of subject property and not a member of your brokerage firm or a licensed real estate agent. I will no longer have any direct communications with the owner or his spouse, and I’m quite upset to find out about the absence of proper agency disclosure at this stage of the sale transaction. Please communicate with me directly going forward, and confirm time for Saturday morning’s walk-through for which I hope you will personally be showing up. Jennifer, I’m not aware of sellers needing to be licensed to show their own home. Not sure why you would assume the owner’s wife is an agent. I’m also not aware of an agency disclosure form telling agents that the seller is the seller. It would seem to be self evident, no? With that said, you can do as you wish but the sellers will be at home for the walk-through. Have a good night everyone! This matter was eventually resolved as the indignant salesperson had copied her manager on the above emails. Her manager replied later that day that her firm does not have any issue with this and are ready to complete the transaction! The key take-away is that while you shouldn’t flaunt the fact that you’re the owner, you shouldn’t pretend to be an agent of our partner brokerage either.